My recent press release about elder photography- photography of the elderly and those with Alzheimer's Disease was published in over 280 online journals and magazines including Alzheimer’s News Today. I finished writing Just See Me- Sacred Stories from the Other Side of Dementia and waiting for edits from editor Joyce Glass- TheWriteCoach. It'll be ready for the publisher soon! Expect book to be released early 2018. Thirteen families were interviewed and photographed for Just See Me-Sacred Stories from the Other Side of Dementia. I'm now following up with interview and video. They tell me how it felt to tell their stories, and have their portraits taken. The photos which were important to them at the time, have become absolutely priceless. The healing power of story telling continues to amaze me. This is how I know I’m doing exactly what I should be doing with Carmen Buck Photography and Carmen Buck.com. Caregiving is a spiritual crisis. Spiritual stress accompanies caregiving. Typically caregiving is thrust upon a family member who doesn't know how to care for their loved one. Their life is changed in often dramatic ways. How will I ever get through it? Where are the people in my life? People they thought were their friends stop coming by. Maybe they don’t know what to say or how to say it or behave and so they avoid rather than ask. I heard consistently how people didn’t ask the caregiver or family what they really needed. Comments like ‘if you need anything let me know’ are useless- right? It puts the asking in the laps of the person who is already beat down. How about- ‘I’m here. What can I do right now?’ How about making a plan? 1. Ask- How can I help? Help me to know what to do? the fact is things HAVE changed. the caregiver is in the midst of it everyday and it is their norm but not yours. ASK them. It is possible they are so much in the midst that they do not realize this is uncomfortable for you. 2. Find ways to get out-even if it means paying for caregiving or respite care. There are day programs and people say even if it is for half a day once or twice a week it can be helpful. If you are a caregiver, take that time to take care of yourself. Self care is a big topic, but if you don’t take care of yourself you won’t be able to go on. I recently met a wonderful person, Josie Zamora who formed a non-profit day program called A Gift of Time in Georgetown, TX. It’s not built yet, and in the planning stage but when it opens- how glorious. I'm excited to work with them to tell their story and the stories of others. Every neighborhood needs a day program/respite center big and loving enough for the community. It is easier said than done given the financial challenges, but caregivers need the break and the person with Alzheimer's Disease or other dementia can benefit from the social interaction..
Offer to give the caregiver a break. Ask what you need to know and assure them. Caregivers may worry about the consequences. 3. Form a posse- a group of friends, other caregivers. Have a group you can just be you. In person or on line. I’ve come to realize the value of this myself. I’ve known, but didn’t take the time to nurture these relationships- too busy, too this or too that. It’s got to be a priority because this is a source of love and acceptance. Be okay to cry on a shoulder, laugh and be silly, have fun and forget about being a caregiver or forget about the disease for just a little bit. It gives us hope. Think about what you need to hear and ask for it. How will people know otherwise. I know I need to hear ‘I’m proud of you- even better I’m SO proud of you.” What do you need to hear? We all need to feel connected to one another. It’s a basic spiritual need. Life, air and water. While it may seem like we can do without it, our hearts keep beating right, persistent unmet spiritual needs leave us depleted and kills us- it zaps our very essence. 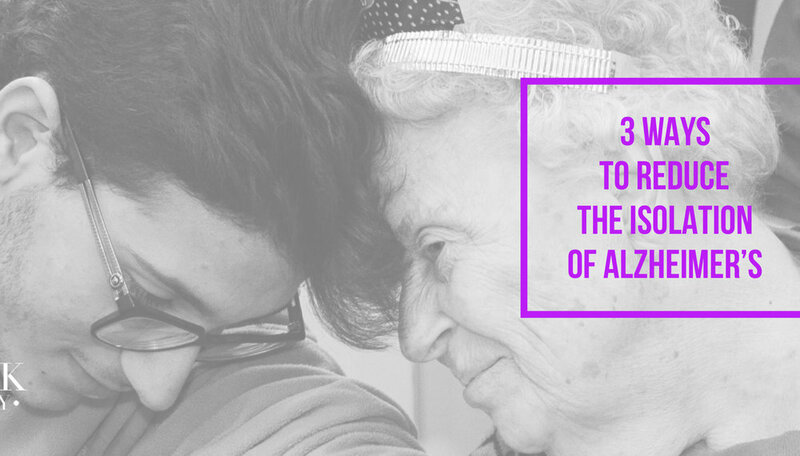 3 Ways We Can Help Diminish the Isolation of Caregiving and Living with Alzheimer's Disease/Dementia. Talk about the difficult things. Ask how can you help? Remember, saying- give me a call if you need anything is not enough. If you aren’t sure how to respond around someone with dementia, ask the caregiver. Remember, this is their world and they are experts. Get out! Get away and have some fun, pampering and break from caregiving. If you are the one with dementia or other illness- it is important for you to have an outlet you enjoy and forget about the illness for awhile. Find a group- engage the group you’ve already got. It's National Caregiver Month and Alzheimer's Awareness Month- Join Carmen Buck as we talk about: 1-Caregiving, Dementia and Isolation What you need to know 2- Update on Just See Me-Sacred Stories from the Other Side of Dementia and articles about my work with photography and the elderly and those with dementia.